Having played second fiddle to Bayern Munich domestically all season Borussia Dortmund again dazzled on the European stage as they crushed Shakhtar Donetsk 3-0 for a 5-2 aggregate win that took them to the Champions League quarter-finals on Tuesday. The German champions, who were on the brink of bankruptcy in 2005, continued their impressive European form with two first-half goals that killed off the tie after a 2-2 first leg in Ukraine as they reached the last eight for the first time in 15 years. Central defender Felipe Santana, a replacement for Mats Hummels, headed in on the half hour and Mario Goetze added another in the 37th. Poland international Jakub Blaszczykowski's close-range effort after an hour buried any lingering hopes for Shakhtar who had come out fighting in the second half but never looked likely to break Dortmund's unbeaten run in the Champions League this season. After two trophy-laden seasons Dortmund trail Bayern by 17 points in second place in the Bundesliga and were also dumped out of the German Cup by their chief rivals last week. However, they have won every home game in the Champions League this season after also beating Real Madrid, Ajax Amsterdam and Manchester City in the group stage. 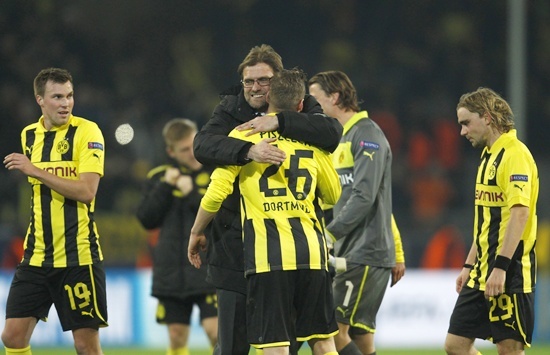 "This is an unusual moment for us," Dortmund coach Juergen Klopp said. "The whole Champions League season has been going so well for us. For 80 minutes we offered a superb game apart from a short spell after the break." "It was a strong performance because it could have gone the other way as well," he said. Their recent domestic setbacks and swirling speculation over forward Robert Lewandowski's potential transfer to Bayern did little to dampen their attacking play. Lewandowski almost put them in front when Goetze sent him through with a defence-splitting pass but the Pole's shot was blocked by keeper Andriy Pyatov. Dortmund, driven on by an impressive 65,000 crowd, kept up the pressure but their finishing was less than clinical. There was nothing complicated about Santana's header in the 31st minute though, the Brazilian rising high above marker Yaroslav Rakitskiy to nod in a Goetze corner at the near post. Santana was again replacing central defender Hummels, who scored a late equaliser to secure the 2-2 draw in the first leg but is out of action with flu. With Shakhtar now on the back foot, 20-year-old Goetze, in sparkling form, turned scorer six minutes later with a sweeping finish after a well-timed Lewandowski cutback that left Shakhtar defenders again exposed. The Ukrainians, who are just back from a three-month winter break, almost pulled one back after the restart with substitute Douglas Costa firing narrowly wide as the visitors poured forward in search of a quick goal. Pyatov, though, spilled a tame shot from Ilkay Guendogan into the path of Blaszczykowski in the 59th minute allowing the midfielder to seal the win. "Set pieces are a real headache for us," Shakhtar centre back Oleksandr Kucher said. "We again conceded a goal after a corner kick. It was hard to fight in the air with these strong Dortmund players."